BIG NEWS! Studio Arrabbiata has moved operations to the Jersey Shore Arts Center in Ocean Grove, NJ. 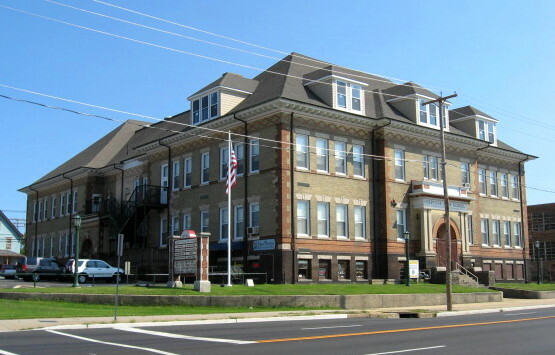 The historic building (on the right) is the former Neptune High School, built in the 1890's and recently restored as a center for arts related businesses and groups of all kinds- visual artists, theater, dance. 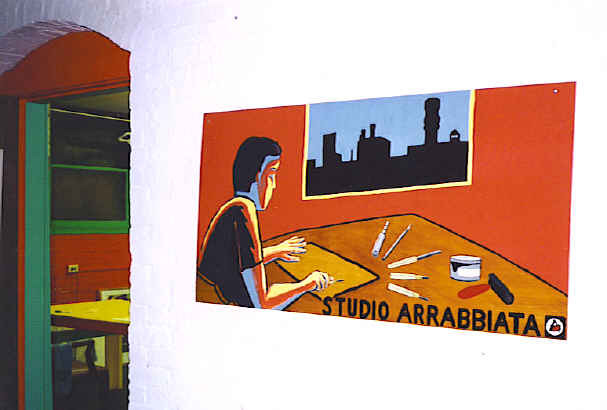 Studio Arrabbiata is is sharing space with Social Animal Press . Photos of the studio space are on the Home page. I've started a blog devoted to life around the studio. It provides an inside look at what I'm up to- new work in progress, information about exhibitions, workshops and studio events, and whatever else I feel like. 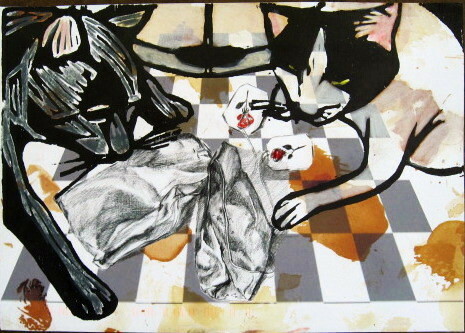 Besides the many links to it on this site, you can go to it directly at http://studioarrabbiata.blogspot.com. Social Animal Press hosts a discussion/critique group in the studio on the first Monday of every month, from 7 pm to 9 pm, or whenever it breaks up. Artists in all media are invited to bring a piece or two (completed or in progress) and join the professional level discussion. The critique group schedule will vary month to month through the spring. People interested in attending should contact me to learn when the next meeting will be. My print on the right has appeared in the 2011 Art on the Edge exhibition at the Belmar Arts Council and at the 2012 Kean University Faculty exhibition. It is one of 4 prints that I had on display in locations around Rahway as part of the Preemptive Strike exhibition, from May 2 to May 30, 2013. 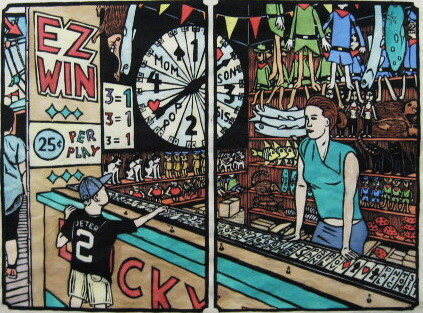 Most recently it was featured at Art Alliance in Red Bank, NJ, a window display devoted to my prints. The print to the left was chosen Best in Show at the Belmar Arts Council's 8th Annual Jersey Shore Juried Art Show. The exhibition ran during April and May of 2012. There was an exhibition of the award winners from that show in February and March, 2013. This print also was received the Old Printshop Award for Graphics in the 71st Annual Audubon Artists Annual Exhibition, also in 2013. The print to the right is one of two collaborative postcard prints I made with printmaker Nanci Hersh, created to be part of For Love Not Money, an international invitational exhibition. The show, which includes 170 prints from 18 institutions and printmaking groups from all around the world, was on display at the Kumu Art Museum as part of the15th Tallinn Print Triennial in Tallinn, Estonia in 2011. 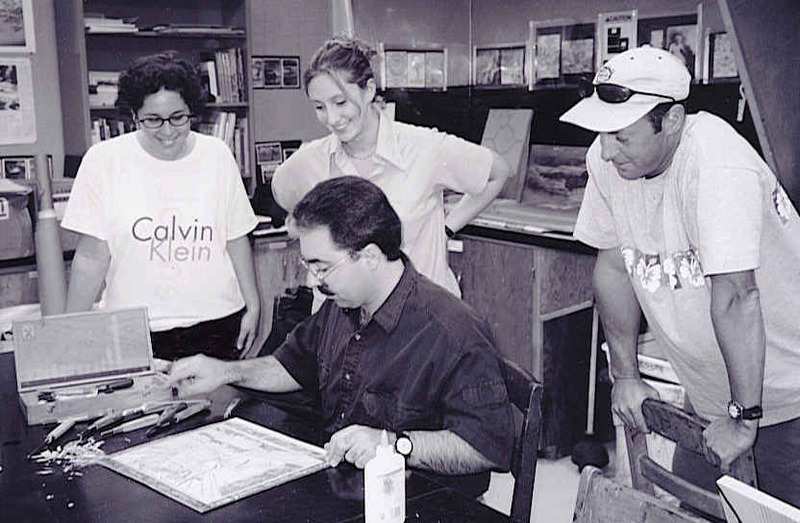 The set of postcards was also briefly exhibited at Rutgers University in Newark, as part of the NJ Book Arts Symposium later that year. I'll post details about possible additional international locations once I get official word. I presented my work and process at the September 2011 meeting of the Westfield Art Association. The presentation included a slide show of the history of printmaking (including my own), and a demonstration of block cutting and printing. I did a similar presentation (minus the slides) for the Freehold Art Society at their May 2012 meeting at the Monmouth County Library. 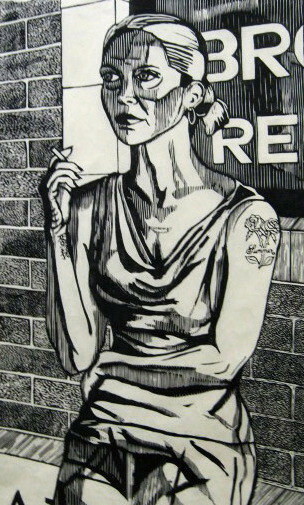 In autumn 2011 I taught a 4 night basic woodcut workshop at the Belmar Arts Council. A few photos can be seen here. I repeated the course again in June, August, and October 2012, and four more times in 2013, with the length of the class sessions extended by student demand. The class had two more runs in early 2014 and is expected to return in August. Information and online sign up will be available on the Belmar Arts Council website.